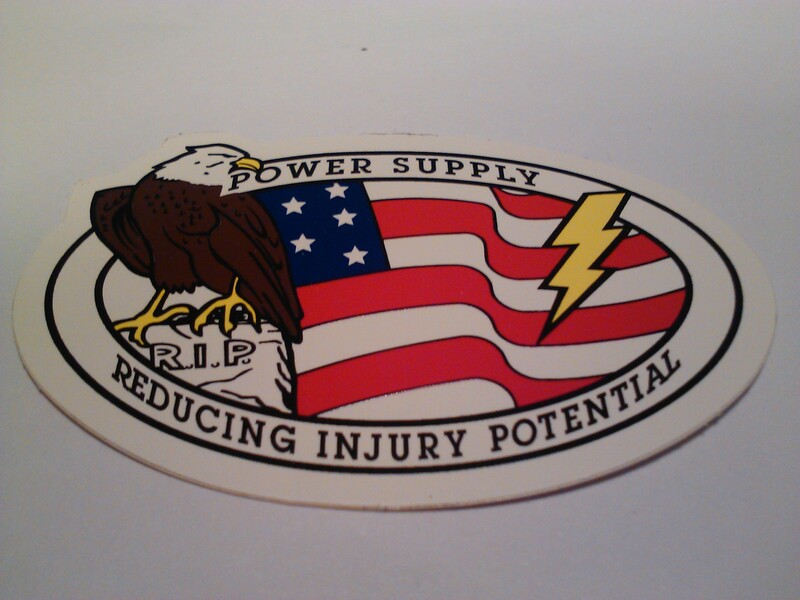 What Does a Hard Hat Sticker Tell You about a Power Plant Man? I have learned one thing from Power Plant Men, and the Power Plant Safety Process is that, when you become comfortable doing a dangerous job, that is when an accident is most likely to happen. Isn’t that when a young driver seems to become careless? 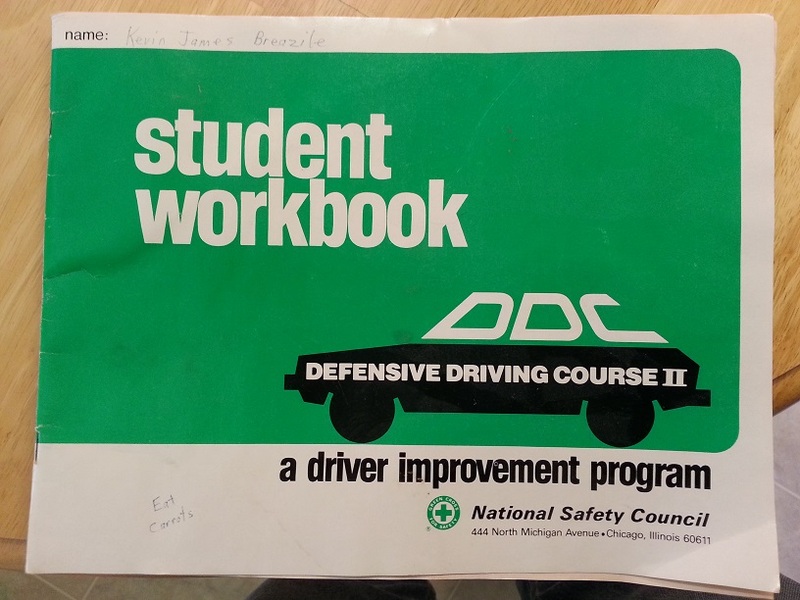 They drive carefully for the first couple of months when they have just learned how to drive, and then when they feel confident about their driving ability, they begin to cut safety corners, and the next thing you know an accident occurs. That was one lesson we learned in our Defensive Driving Course. 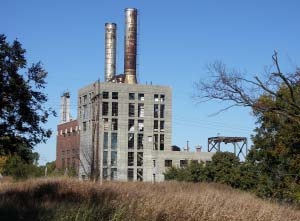 In the spring of 1986, while I was an electrician at the Power Plant in North Central Oklahoma, I went with another electrician, Ted Riddle, to work on a Major Overhaul for three months in Oklahoma City at a Power Plant just North of Mustang. 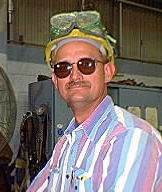 While we worked there, we would eat lunch with a man well into his 50’s that was our acting foreman for the overhaul. 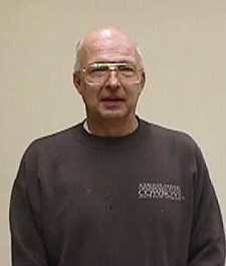 His name was Willard Stark. 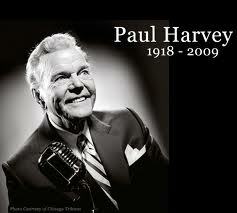 During lunch we would listen to Paul Harvey on the radio. When Paul would mention a date 20 years in the past, Willard would be able to tell us what he was doing on that day, many years earlier. I was fascinated by his ability. I will probably talk about Willard more in a later post, but today, I mention him only because of his ability to remember what happened on dates long gone by. Now that I am about the same age as Willard was then, I am beginning to see that certain dates hold a special significance. The more memorable the experience, either for the good or the bad, and I seem to remember what day it happened. 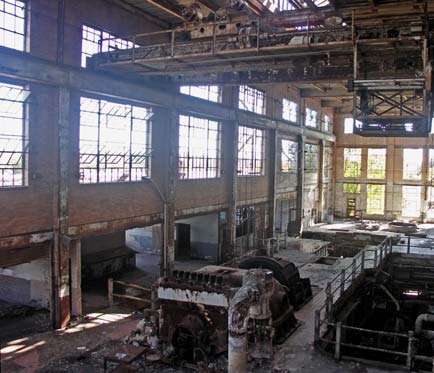 That leads me to one of the memorable dates in my past life at the Power Plant. The particular date was July 15, 1980. 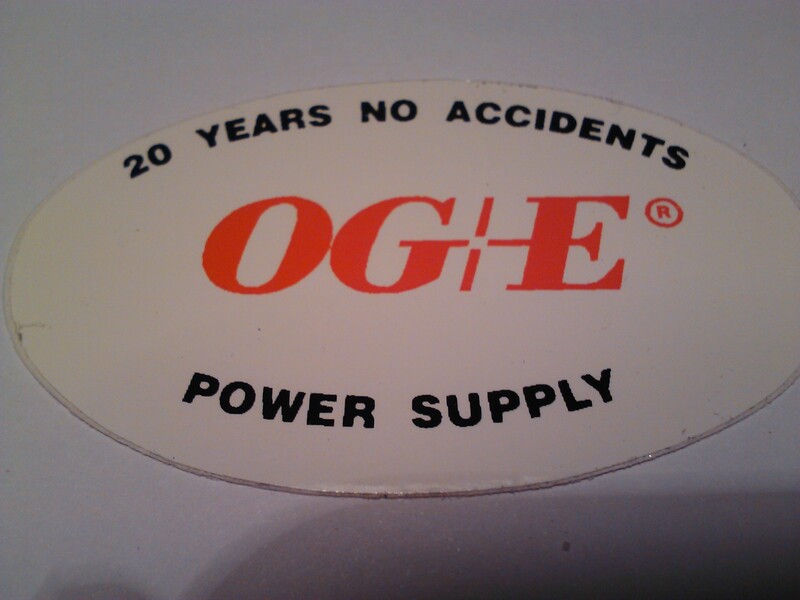 I was working at the power plant during my second summer when I was normally working out of the garage. But Stanley Elmore had told me to go to the Maintenance Shop and get with Ray Butler, because he was going to have me do some cleaning up around the shop. When I arrived, Ray told me to go over and wait with this new hand that they had just hired the day before, and he would be over there in a few minutes when he finished what he was doing. I walked over to the young man (I say young, but he was 6 years older than I was. He was 25) named Kerry Lewallen. I introduced myself to him, and we waited together for a few minutes until Ray came over and told us to get a forklift and move some crates that were nearby over to the Warehouse, and then meet him there to help build some shelves in the warehouse to store the larger material on pallets. The reason I remember this day so well was because of what happened right after Ray walked away. Kerry looked at me and asked me if I wanted to drive the forklift. Well. 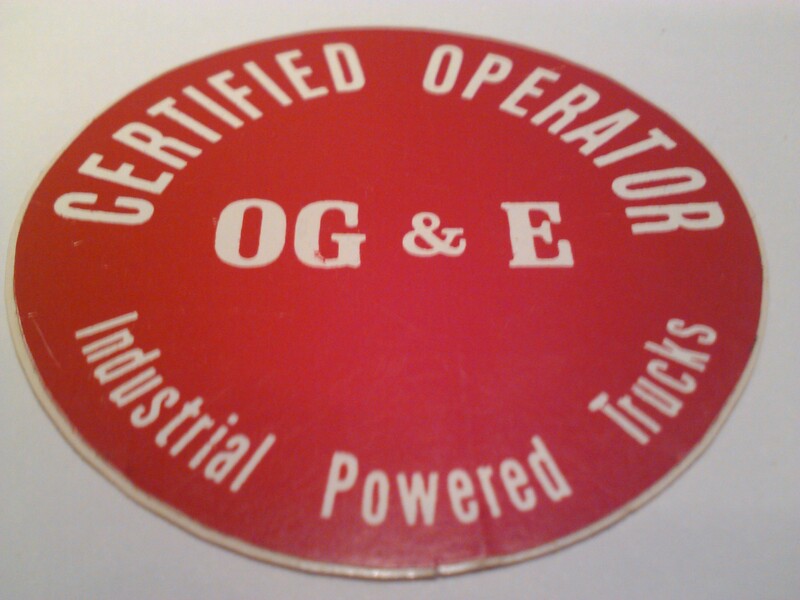 I really did want to drive the forklift, because I thought it would be fun, but from my experience at the plant, I noticed that people like Larry Riley had a Hard Hat Sticker that said: “Certified Operator Industrial Powered Trucks”. So I explained to Kerry that I wasn’t Certified to drive a forklift. Kerry had only worked there one day before that day, and even though he probably had a lot of experience driving a forklift (as most Power Plant Men did), he didn’t feel comfortable driving the forklift either. I watched Ray as he listened, and I noticed a very faint smile as he realized what Kerry meant to say. Ray agreed, and said he would take care of it. I believe that was the day he took us to the warehouse and circumcised both of us to drive the forklift right then and there. I couldn’t wait to get home and show my parents. 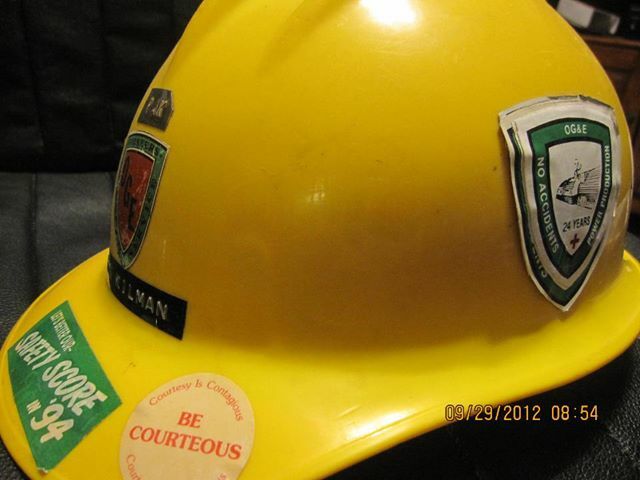 As you can see, I was so proud of my new hardhat sticker, I didn’t put it on my hardhat, I just brought it home and framed it and hung it on the wall. That was July 15, 1980. Being Circumcised to drive the forklift was kind of like my “Come to Jesus” moment in my Power Plant journey. As with Jerry Mitchell, my wife came home one day and told me about this very nice person that she worked with as a Nurse in the Stillwater Medical Center. She described her as being a very honest and pleasant person to work with. She also told me that her husband worked at the Power Plant. Her name was Vicki Lewallen, Kerry’s wife. I didn’t place this on a hardhat either. Well. I was walking out the door leaving my hardhat behind (so to speak). I don’t remember how long the Plant Manager Eldon Waugh had worked for the electric company, (about 40 years) but just a couple of months before he retired, while driving back to the plant from Oklahoma City, he took an exit off of I-35 behind a semi-truck. The truck stopped on the ramp realizing that he had taken the wrong exit and proceeded to back up. He ran into the company truck that Eldon was driving causing an accident. 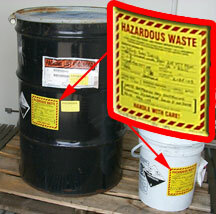 This was enough to ruin Eldon’s perfect safety record just months before he retired. The thought was that Eldon should not have pulled up so close to the truck, or have kept the truck in line with the driver’s side mirror so that he knew he was there. 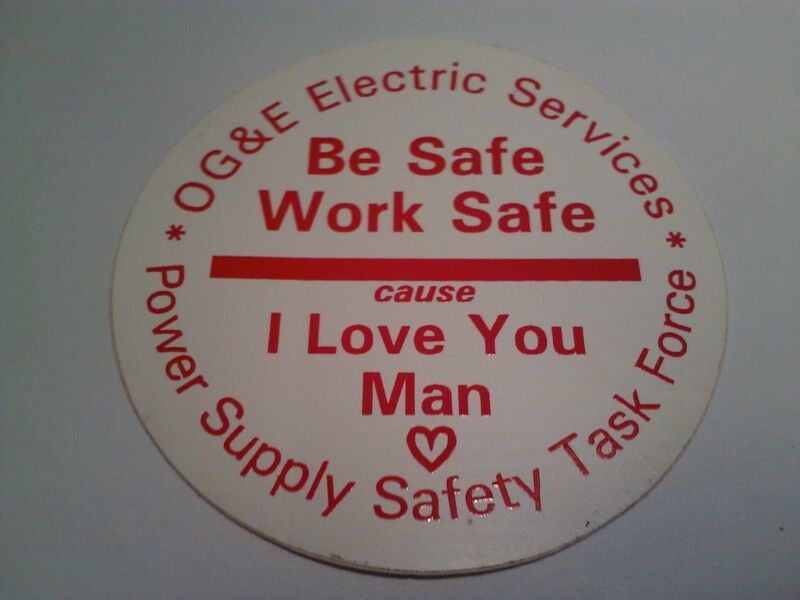 Throughout the years that I worked at the plant we would have different Safety programs or initiatives that would help to drive our safe behavior. Since back injuries were a major concerned, we would watch films about lifting properly. Since we worked with heavy equipment we would watch videos about people being injured while working with dozers, and other big tractors. When our new plant manager Ron Kilman arrived after Eldon Waugh, he had us watch a film where there was a near fatal race car accident. When they looked more closely at the accident, it turned out that there were many things that had to happen wrong that led up to the accident. When an accident occurs on the race track, a Yellow Flag is raised, and everyone gets in line and takes it slow around the track until the accident is cleared. 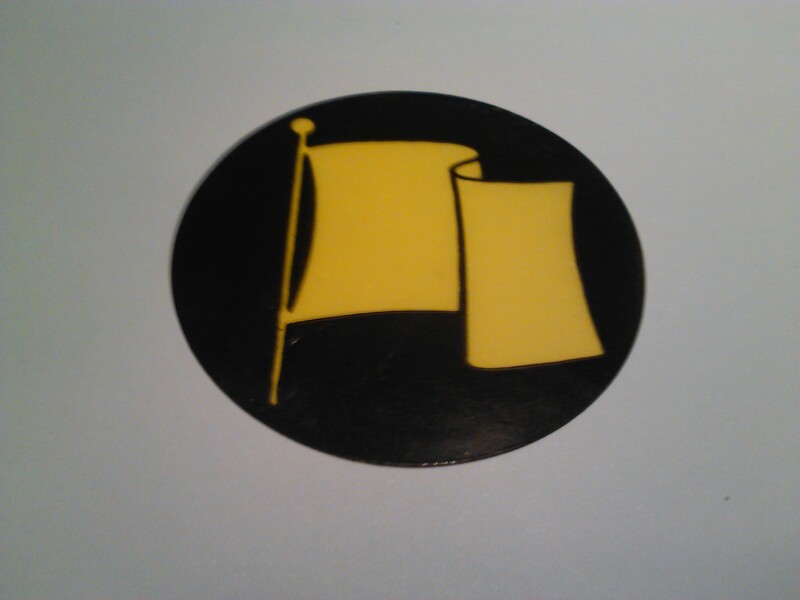 In the movie, the thought was that it would have been helpful if the yellow flag had come out each time someone was about to do something wrong “Before” the accident happened. I didn’t receive one of the stickers that he came up with that I really liked because I was away at the time on an overhaul when they were being handed out. Many years later, when I mentioned it to the guys at the plant in an e-mail, I was given a stack of them by Randy Dailey the next time I visited the plant. Ron said he stacked his Yearly safety stickers on top of each other as you can see. 24 years of working safely. 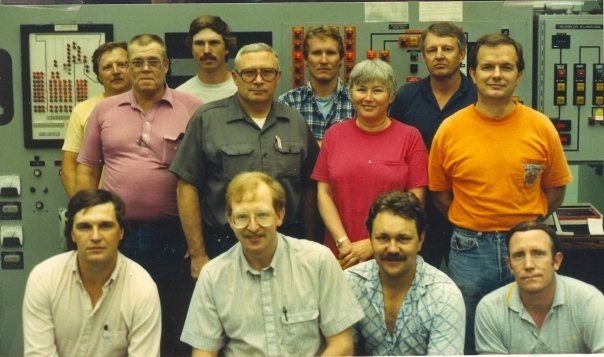 Usually when I write a Power Plant Man post, the story is about the Power Plant Men and Women I worked with during the 20 years I spent at the Coal-fired Power Plant in North Central Oklahoma. Today’s post, however, is more about a particular experience I had during this time period. Some Power Plant Men at the plant were witnesses to the events, but for the most part, this was personal. This story begins early in the morning on New Years Day 1987. Some time around 3:00 am. I woke up suddenly in the middle of the night from the bed where I was sleeping at my parents house in Stillwater, Oklahoma where my wife and I were visiting on New Year’s Eve. It felt as if someone had crept into my room and stabbed me in the back with a knife! I jumped out of bed, flailing to fight back, only to find that Kelly and I were alone in the room. A quick search of my back with my right hand told me that I didn’t have any external injury, even though the pain indicated that a knife of some sort was still piercing my lower back as if someone was working the knife around trying to increase the pain. Not wanting to wake my wife, I left the room and went into the hallway. I figured I must be having a kidney stone. I seemed to recall a similar pain many years earlier when I was a boy. At that time the pain didn’t last too long, and I figured that I would just drink some water and hope that it would work itself out quickly. Some of you who have experienced this pain probably guessed this from the start that I was having a kidney stone. there isn’t much that is more painful than having a kidney stone, especially if the kidney stone is of any size and spiky. 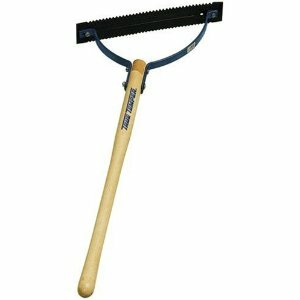 I did finally wake up my wife and tell her that I thought I was having a kidney stone. She is an RN, and I figured she would know what to do if I passed out from the pain. Besides, I didn’t want her to think the house was haunted if she woke up and heard some moaning and groaning out in the hallway. Luckily for me, the kidney stone was small and without spikes. I was able to pass the stone through the painful stage in less than hour. It felt as if I had dropped a pebble right into my bladder. A quick trip to the bathroom, and I emerged with a little stone the size of a piece of sand. The next morning (still New Year’s Day), we drove back to Ponca City where we lived at the time. We were only about 3 miles north of Stillwater when all of the sudden, I was hit with another stabbing pain. This time coming from the lower left side. It was that same experience as a few hours earlier. I was able to pull the car into the gas station at Bill’s Corner. I climbed quickly out of the car, paced back and forth for a minute or two, and then climbed into the passenger seat as Kelly drove the rest of the way home. At some point on the way home. I think it was about the time we passed the power plant, the stone had worked its way down into the bladder and the pain was over. We scheduled an appointment with a Urologist the following week, and when I arrived at the doctor’s office, I gave him the two kidney stones and he had them analyzed. 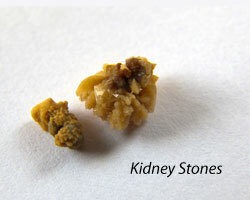 They were the typical kidney stone made of Calcium Oxalate. The doctor’s advice? Cut down on my calcium intake. Ok. So, I stopped drinking a glass of milk each morning before I left for work. The result was that every 3 months I churned out another kidney stone. For the next 10 and a half year, every 3 months I had a kidney stone. Sometimes they were easy. Other times they were difficult. It depended on the size and shape of the stones. I began saving them in one of those cases that people use for their contact lenses. The ones that have a side for the left contact, and one for the right contact. 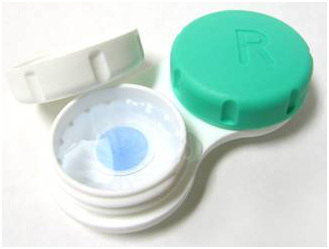 A contact lens case with an L and an R for the Left and Right eye. I would put the kidney stones from my left kidney in the Left side, and the right Kidney in the R section. How did I know which was which? It was easy. Was I being stabbed in the back on the left or the right. So, what does this have to do with Power Plant Men? Well, at times the Power Plant men had to deal with me while I was in the middle of having a Kidney stone. Most of the times it was just as a bystander sharing in my misery as they watched me pace back and forth as pale as a zombie. Other times it was riding shotgun in peril of their lives as I struggled to bring my car safely to a stop while writhing in pain. Here are some instances I remember. One day when Scott Hubbard and either Toby O’Brien or Fred Turner were in my car as we were driving to work, I was suddenly hit with a bat across my lower back. I vaguely remember saying, “Oh No!” I asked Scott Hubbard, who was sitting in front with me to dump the contents of my lunchbox out on the floor of the car. You see, when a kidney stone is in full swing and the feeling of intense pain begins to build up, there is a plexus of nerves around the kidneys that send a message to the stomach that it would be best if the stomach is empty. Meaning that any recently eaten breakfast should be evacuated as quickly as possible. I struggled to remain conscious and sane and to keep the car on the road. We were only about a mile from Bill’s Corner (where I had stopped during my second kidney stone on New Years Eve (many years earlier). So, I headed for there as a place to jump out of the car. Only this was a much worse kidney stone that during the last time I pulled into the gas station to switch sides with my wife. I was going to have to turn around and go home. I wasn’t going to be passing this one any time soon. When I climbed out of the car, I made it to the back of the car just in time to eject the contents of my stomach onto the pavement. When you are sick and you vomit, it usually makes you feel better because that it over. When you have a kidney stone, vomiting is only about as much relief as taking a breathe. Luckily some other Power Plant Men had stopped at the gas station to fill up their vehicle and they had enough room to take Scott and Toby, (or was it Fred… Fred? You read these posts…. was it you?). I asked Scott to tell our foreman that I wasn’t going to be in for work today. I climbed back into my Honda and pointed the car toward home. 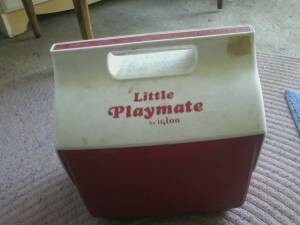 With my Little Playmate Lunchbox open at my side, I drove home. When I walked in the door at home, my wife immediately knew what was happening. She comforted me by saying, “Poor Beast.” While I began the ritual of drinking water and pacing around the house. You see…. At this time I no longer went to the doctor or the hospital when attacked with a kidney stone. I had learned my lesson many years earlier. Early on, in Ponca City, when I had a kidney stone, I went to the hospital bent over in pain and having visions of my life passing before my eyes as if I was already in the middle of judgement day. When I would arrive in the emergency room, they would give me a shot of morphine to ease the pain. The problem with morphine was that I was already using all my mental faculties to suppress the pain, and as soon as the morphine would begin taking effect, it took away my ability to block the mentally blocked pain. I would end up, for about 20 minutes while the morphine was taking its full effect on my senses, climbing the walls in really intense pain. Then eventually they would send me home where I would be sick from the morphine for about a week even though I may have passed the kidney stone in a day or two. During the worst kidney stone I encountered while I was living in Ponca City, (during the first 3 years that we were married), it took about 5 day to pass this one stone. It was especially rough. Usually the only relief I had from this particular stone was to pass out from the pain. Pacing didn’t seem to work. Drinking water didn’t seem to work. It seemed like this particular stone was stuck right at the bottom of the Ureters. That is, the urinary tract just before the bladder. I knew that if it would only fall into the bladder, the intense pain would be over. I remember how this passed very clearly. 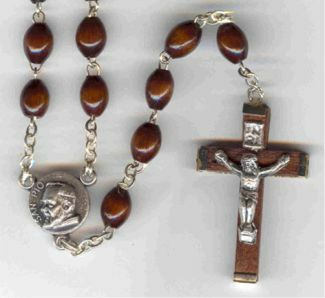 I was kneeling on the side of the bed saying a Rosary (the Sorrowful Mysteries of course). One of the Sorrowful mysteries of the Rosary is to meditate on the Scourging at the Pillar. That was what I felt I was going through at the time, so I had been saying the sorrowful mysteries all week. I finally prayed to God something I usually refrained from doing…. I said to Him. “Father…. this is enough. This is all I can take. Please take this away from me.” Almost immediately the kidney stone dropped into my bladder. Oh my gosh! I climbed up into the bed and fell asleep. The pain had finally ended after 5 hard days. I was awoken 5 hours later. My Father was calling me from Florida where he was working at a Veterinary Clinic training the employees of the clinic for continuous education. (See the post “I Think I Can, I Think I Can and Other Power Plant Man Chants” to learn more about my Father and Tom Houghton who owned the Veterinary Clinic). He told me that about 5 hours earlier he was struck with kidney stone. 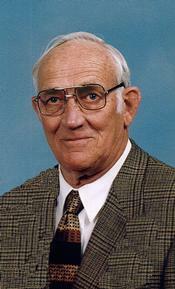 My father, though he had one kidney stone when I was a boy, was not prone to kidney stones like I was. 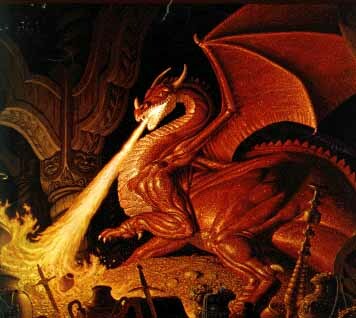 It seemed as if the moment that I was relieved of my pain, my Father had picked up the torch and carried on the pain. I apologized to him, because I had prayed that the pain I was feeling would go away and it seems as if he had to experience whatever pain I was meant to finish bearing. The coincidence was too much to belief. He had just passed the stone and wanted to call me to tell me, since he knew that I was regularly experiencing kidney stones at the time. I resolved from that time on, to go ahead and suffer through whatever pain was being sent my way, because it appeared as if it was for a reason of some sort. I never prayed to have the pain leave again. Only that I was able to endure it. Back to the Power Plant. One day Diana Brien and I were doing some work in the Coalyard Maintenance building, where the Labor Crew called home. 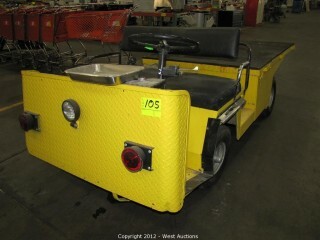 We had driven the electric cart to the coalyard to work on whatever we were working on. The moment we sat in the cart to head back to the electric shop. Wham. I was hit with a kidney stone. I didn’t want to mention it to Dee. There was no need in worrying her, or embarrassing me, so I just remained silent. I just held onto the side rail on the cart and closed my eyes. As we banged over the railroad tracks and down the gravel road on the hill, I just held on and thought…. “don’t throw up…. don’t throw up….” I concentrated real hard to try and ease the pain. When we reached the shop, without a word, I walked into the shop and straight into the bathroom, where I began peeling back clothing. That is, I undid my belt, and unsnapped my pants. I paced a few minutes… then feeling the kidney stone hit the bladder, I relieved myself and walked back out into the shop. I figure all the jostling about on the bumpy road in a card with no suspension system helped move the stone down quickly. Dee and Scott Hubbard knew right away what had happened to me. There was no hiding the pale face and the sweat that was running down my face. I went in the office to rest a while. After a while I was ready to go back to work. So, for all you kidney stone sufferers, here is a few words of advice. Today I have passed more than 55 kidney stones. I have never had one of them removed by any other means than passing them myself. I have passed very large kidney stones. Some so big you could crush them in your fingers. My largest kidney stone was almost as large as this one. First of all. Don’t panic. 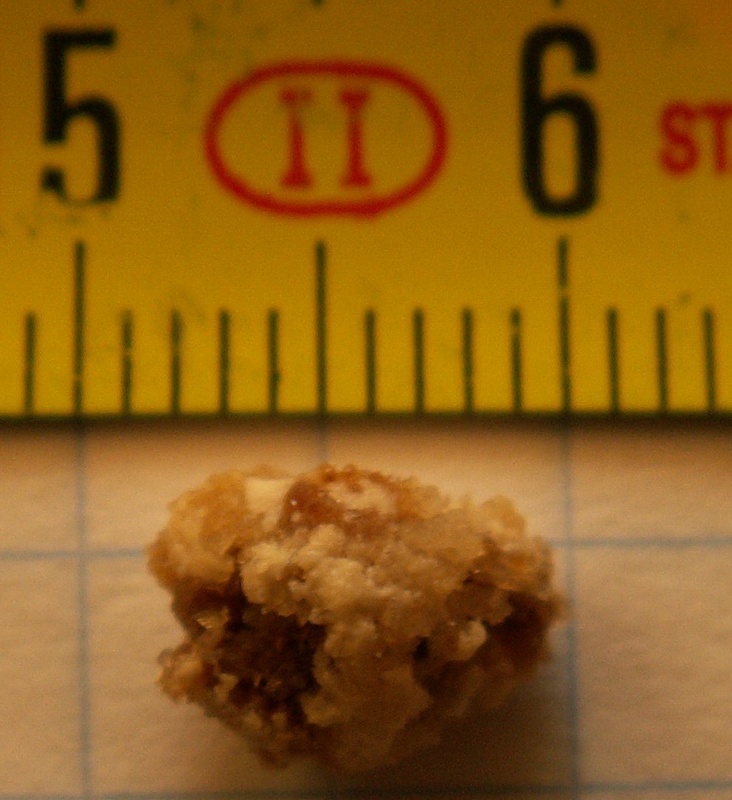 Kidney stones won’t kill you (at least not right away). The first thing that happens is that the muscles in your back tighten up. This is not a good thing. You need the muscles in your back to relax. Concentrate on relaxing those muscles. I used to use a handheld massager to try to relax the muscles. Now I just concentrate on relaxing the back. Today when I have a kidney stone, even a large one, I am usually able to pass it within hours. Pace a lot. Drink a lot of water. You will only move the kidney stone down into the bladder by drinking water and pacing (or a massager maybe). I walk back and forth in the house. I have a path that I take. I walk back and forth, then I sip water each time. Don’t worry about throwing up. It’s just part of the reaction to the pain. I only have about one kidney stone of any size once each year these day. I found that taking a good dose of CitriCal each day (yes. 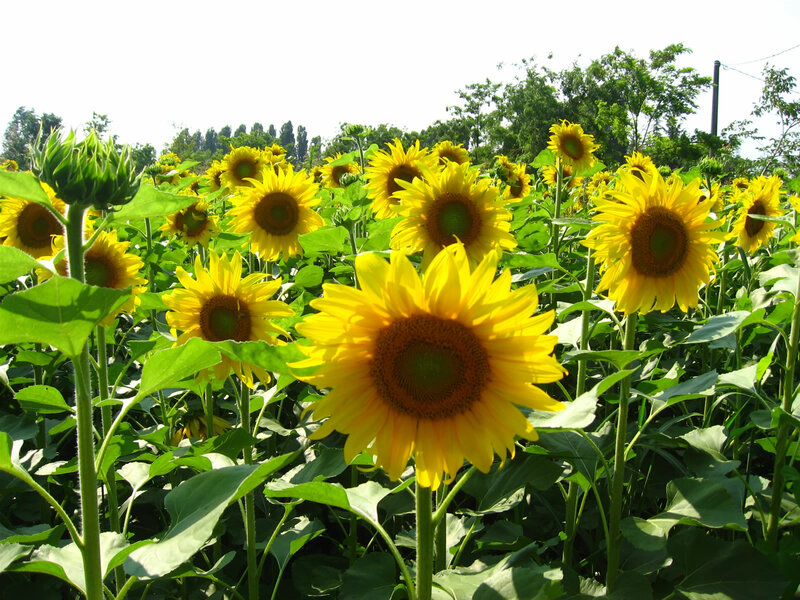 Extra calcium, has reduced the number of kidney stones considerably). If you are Catholic… then offer the pain up for souls in Purgatory. It is our belief that the painful time that a person suffers in purgatory can be shortened by someone else offering up their pain for someone in purgatory. Note the difference between suffering and pain. Pain is the sensation you receive. Suffering is what you do with it. When you accept the pain and you “embrace” it, then you suffer it. If you moan and groan a lot, you basically pass it on to others. You tell them…. “I am in Pain.” Then they empathize with you and in a sense “feel your pain.” If this helps comfort you, ok. If you want to offer it to someone in Purgatory, then accept your pain in silence (I realize this makes no sense for those who do not accept the idea of Purgatory). 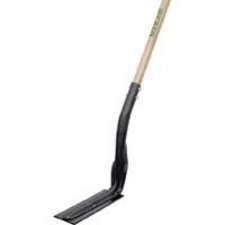 For those Christians that are not Catholic, let me offer you another way to suffer the pain from a kidney stone when it is too intense to bear. St. Paul said the following: “Now I rejoice in my sufferings for your sake, and in my flesh I complete what is lacking in Christ’s afflictions for the sake of his body, that is, the church” (Col 1:24). With this in mind, the pain felt during a kidney stone has great meaning. It literally unites you with Christ during his Passion. I realize this has been an odd break from the usual Power Plant Man Post. 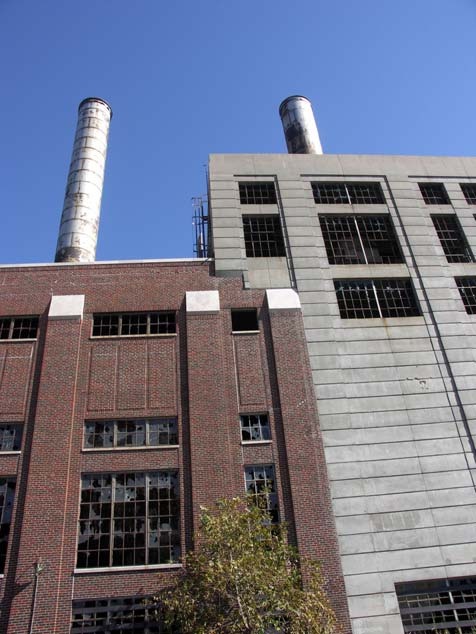 The power plant man posts for the remainder of the year will be those posts that include stories from the time that the plant was ruled under the “evil plant manager” Eldon Waugh. Beginning in January, for the next year, the post will be stories during the reign of the plant manager, Ron Kilman (1987 to 1994). During the year 2015, the stories will be during the reign of Bill Green until I left the electric company (1994 to 2001). Kidney stones are evil. I’ve had some, but none since 2009. The one change I made was to drink lots of water. I try to drink at least a half a gallon every day. The clearer your urine the better. Yes Kev I was there and remember it well. Not that you moaned and groaned but when you set up straight in your seat and had a look on your face like. . .something was terribly wrong. I offered to drive you home but you assured me you would be ok driving home. I did bum a ride with someone at Bill’s corner to work. Anyway Kevin, this is how I got rid of them. I started taking MAGNESIUM, a small dosage every day, it binds with the calcium & you urinate it out before it can form into a stone, works for me, I haven’t had one in twenty years now. If I feel that familiar pain in my back I know it’s because I’ve neglected taking my magnesium, so I double up for 2 or 3 days & problem solved. P.S. I don’t get a chance to read these every day you send them out, the best I can do is save them up & read them at work when I have the time, so I am usually far FAR behind your most recent posts, but I really enjoy them. Wow. You’re very brave! My first thought was, like one of the last commenters-drink about a half gallon + a day, but I’d suggest distilled. Most of the ‘water stores’ where you fill your 5 gallon jugs will offer RO (reverse osmosis ) which still has some minerals, and straight up distilled water. I drink the distilled like that, (it does taste a little flat, but you get used to it) because according to the ‘experts’ the lack of minerals makes your kidneys work far less hard as the water passes through (no accumulation of minerals possible from it) plus your body really benefits from all the direct and useable hydration…. Wonder if the electrical fields contributed to your condition as well? Be well, my friend! Thinking of you, for sure! The problem with morphine was that I was already using all my mental faculties to suppress the pain, and as soon as the morphine would begin taking effect, it took away my ability to block the mentally block the pain. I would end up, for about 20 minutes while the morphine was taking its full effect on my senses, climbing the walls in really intense pain. Then eventually they would send me home where I would be sick from the morphine for about a week even though I may have passed the kidney stone in a day or two.